At the Tuesday, Sept. 13 Baseline Mansionization Ordinance/Baseline Hillside Ordinance hearing in West L.A, the city Planning Department presented zoning options for neighborhoods under the Interim Control Ordinance (ICO), which includes Mar Vista, east Venice and Kentwood. Pacific Palisades is now treated as an ICO, ever since a paragraph was added to the July 14 planning document just before a vote by the city Planning Commission. Nearly 400 people packed the room, with close to 100 standing and others sitting on the floor during the almost two-hour presentation and hearing. City Planner Christine Saponara presented the R1 Variation Zones Code that were released to the public on Aug. 11, supplementing the BMO. 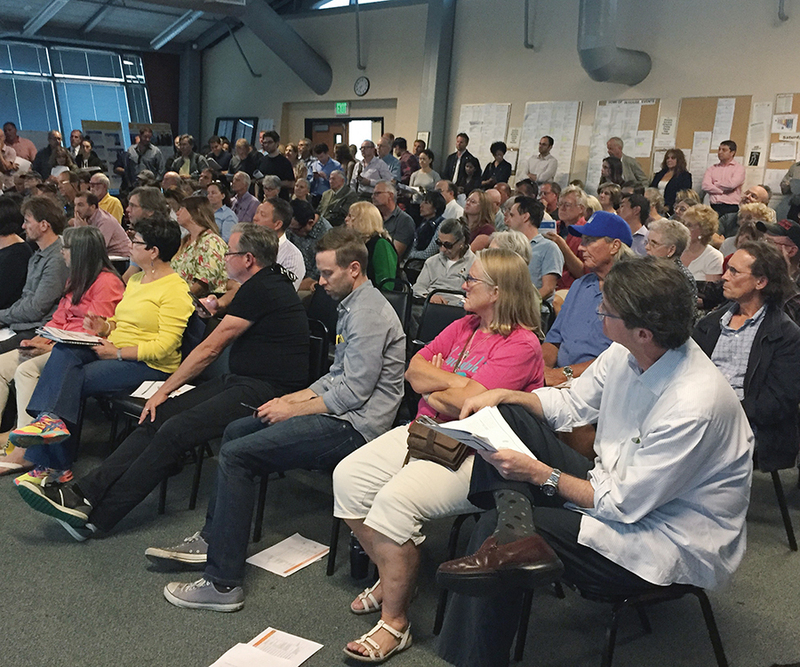 About 400 people from Mar Vista, Kentwood, east Venice and Pacific Palisades listened as L.A. City Planning Department staff discussed proposed zoning changes. The Planning Department now recommends the R1V1 option for Pacific Palisades. This means that a 10,000 square-foot lot could have a house that is 55 percent of the lot size. If a garage is built in the back of the lot there would be a 400-square-foot exemption; built in front there would be a 200-square-foot exemption. By contrast, the 2016 BMO proposed for Los Angeles allows a house that covers 45 percent of a 10,000-square-foot lot, with a 200-foot garage exemption. The R1V1 is closest to the existing ordinance (2008 BMO). Currently, on a 10,000-square-foot lot, one can build 50 percent, plus 20 percent of that 5,000, with exemptions of 250-square-foot for covered porches and breezeways and 400-square-foot for a garage. For those who live on 6,000 to 7,000-square-foot lots, the R1V1 will allow building up to 63 percent of your lot—with a 400-square-foot exemption for garages in the rear and 200-square-foot for the front. By contrast the proposed BMO is 45 percent of lot size with no exemptions. Palisadians who live in the flats but are in the coastal area, which includes lower Marquez, as well as portions of Pacific Palisades Community Council area 6, are in the RE zone, which would fall under the proposed BMO/BHO. After the presentation, the public was allowed to comment on which zoning they felt best fit their neighborhood. Hearing moderator Phyllis Nathanson first listened to people from Kentwood, Mar Vista and East Venice. Themes, similar to those that have been expressed in the Palisades, emerged. Some people decried oversized houses and the loss of natural light, while others maintained they have a right to build as large a home as is allowed under current zoning. There were many people who wanted tighter restrictions, and those who wanted to maintain the current restrictions. About 20 Palisades residents spoke, including those who live in the upper Chautauqua neighborhood. “Our homes are low. There are many one-story houses that don’t impede the view,” Ann Kerr said. “We would request to be excluded.” Neighbors Michael Jackson and Hillary Henson chimed in to agree with her. By contrast, Palisades Civic League President Richard Blumenberg said, “I support the R1V1; it is closest to the guidelines that we currently support,” referring to his board’s purview of most residential neighborhoods on the flat areas from Chautauqua to western Marquez Avenue (excepting the Huntington). Community Council representative Sue Kohl supported the R1V1 for the Alphabet neighborhood, as did Terrence Smiglia. The Planning Department is looking for continuing feedback and will process emails with individual opinions through Sept. 25. Send to neighborhoodconservation@lacity.org. New Zone maps will be drawn up and planning recommendations will go to PLUM, mostly likely November 10. If approved, the recommendations will then go before the full City Council. 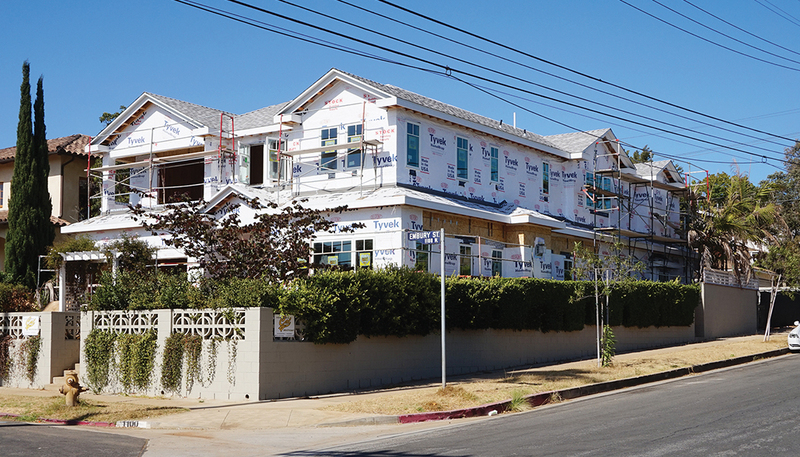 When Planning Department representatives attended the Community Council meeting on September 8, many board members expressed the view that current zoning is fine in Pacific Palisades—and isn’t the key issue. Senior Planner Ezra Gale told Dembo, “Contact us and we will talk you through the process, so an inspector will go out and verify that the builder is following the plans.” His email: Ezra.gale@lacity.org.